Toronto – December 1, 2018 – Each year on December 3, the world recognizes the International Day of Persons with Disabilities to promote the rights and well-being of the millions of people across the globe living with disabilities. The day is also meant to shed light on the physical, social, psychological and economic barriers many of those in the disability community must endure on a daily basis. The signs of disability vary from being visible to invisible. In Canada, there are approximately 3.8 million adults and children – almost 14 percent of the population – living with disabilities. The reality of living with a disability makes an individual further at risk of living below the poverty line, and those with a disability are more likely to be excluded from entering the workforce due to barriers to accessibility that still exist today. The theme of this year’s International Day of Persons with Disabilities is empowering persons with disabilities and ensuring inclusiveness and equality. This can be achieved by highlighting progress and obstacles in implementing disability-sensitive policies in your workplace, as well as promoting public awareness to break barriers and open doors for an inclusive society for all. 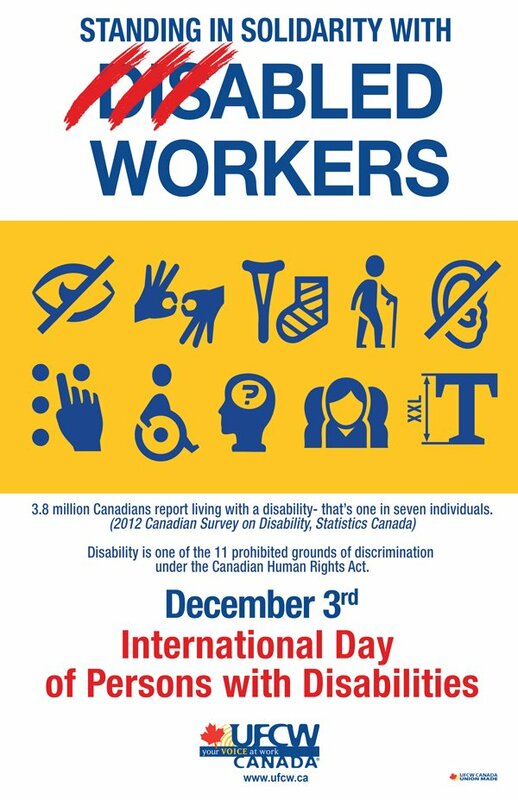 On this day, let us renew our collective commitment to breaking down those barriers and ensure that each and every one of us works towards integrating persons with disabilities into every aspect of the Canadian workplace and society.